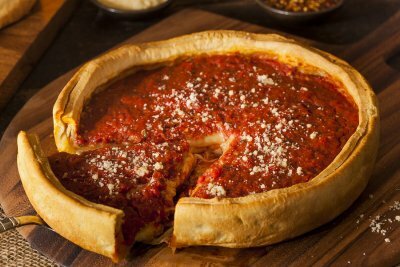 Chicago pizza might be the most famous Windy City dish available near Palo Alto, but it’s not the only one. At Pizz’a Chicago, we also serve hearty sandwiches inspired by our hometown favorites. When you want a taste of Chicago but aren’t in the mood for a deep-dish pizza, try one of these sandwiches. 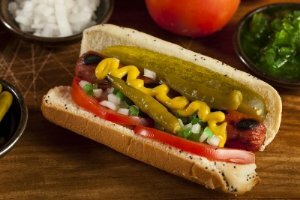 Our Chicago hot dogs feature all-beef frankfurters from the Vienna company, Chicago’s most beloved hot dog maker. They come with a side of fries and, in true Chicago fashion, no ketchup (though it’s available if you insist). For a heartier meal, order the Oprah, named after the beloved TV personality whose studios are located just west of the Loop. This classic meatball sandwich is topped with melted provolone and delicious red onions. Lighter appetites will enjoy the Ferris Bueller, which features roasted turkey, tomato your choice of Provolone or Swiss cheese, with mustard, mayo, and in a nod to our California location, fresh sprouts. You can also order any sandwich with your pizza delivery order and we’ll bring it right to your door! The FDA recommends a balanced diet for adults that includes foods from every major food group every day. The food groups are: fruits, vegetables, grains, proteins, and dairy. One slice of pizza has foods from every single group! The tomatoes in the sauce are fruits, and you can also select popular fruit toppings such as pineapple. Fresh veggie topping options include bell peppers, zucchini, onions, and spinach. Meats such as sausage, ham, and pepperoni provide protein, or you can order mushrooms if you’re a vegetarian. And of course, the delicious cheese rounds out the food groups with dairy. On a more basic level, every meal you eat should ideally contain protein, fat, and carbohydrates. Protein, found in both the cheese and meat toppings of a pizza, aids in muscle development. 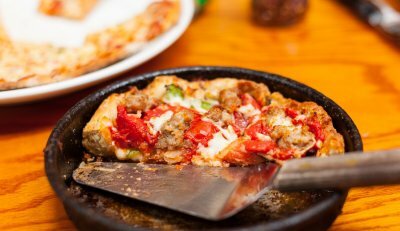 Fat, despite its bad reputation, is essential because your body needs it to absorb fat-soluble vitamins such as A, D, E and K. Like protein, fat can be found in the meat and cheese on your pizza. 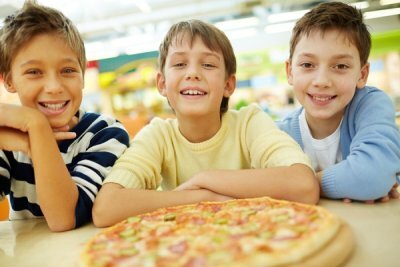 Carbohydrates, such as those in the pizza crust, fuel your body during heavy exertions and exercise. 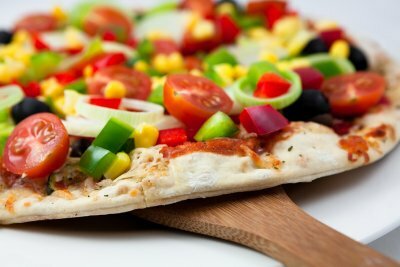 Even gluten-free diners need carbohydrates, which are still found in the crust of gluten-free pizza. For proper bone health, you need to consume a certain quantity of calcium. The cheese on a slice of pizza has more than enough to meet your daily requirements. The tomatoes in the pizza sauce also contain many vitamins and minerals, including vitamin C, potassium, vitamin A, vitamin B6, and vitamin E. Other toppings, especially vegetables, will provide even more nutrient density.